BANGI, 2 July 2010 – A UKM Professor, Dr Mohamed Amin Embi, the Deputy Director (e-Learning) Centre for Academic Advancement has been declared the winner for Technology by the Islamic, Educational, Scientific and Cultural Organisation (ISESCO) Center for the Promotion of Scientific Research (ICPSR) for this year. Prof Dr Mohamed Amin received the “ISESCO Prize in Science & Technology 2010” in recognition of his outsanding contributions in the field of Technology. It consists of a certificate, a gold medal and a cash award of US$5,000. He was among six scientists from Muslims countries given the award by the Rabat, Morocco based ISESCO, a body set up by the Organisation of Islamic Countries (OIC). The award will be given at a ceremony in Kuala Lumpur this October in conjunction with the Fifth Islamic Conference of Ministers of Higher Education and Scientific Research”. The other five winners were Dr Hosein Baharvand from Iran for Biology, Prof. Dr Mirsaidon Ulmas of Tajikistan (Chemistry), Prof. Dr Muhammad Qasim Jan from Pakistan (Geology), Dr Odibat Zaid from Jordan (Mathematics) and Dr Shabat Mohammed from Palestine for Physics. Prof Mohamed Amin’s name will be included in the list of “ISESCO Science Laurettes”. His outstanding contributions in his field had before this been recognised by UKM and the country. Prof Mohamed Amin’s contribution in the advancement of e-learning in Malaysia is evident in his R&Ds and innovations undertaken in the past few years. He is the founder and advocate of online teacher development centre including Virtual Teacher Education Centre (VirTEC), ELT-Online Teacher Resource Center (ELT-TreC), Gerbang Maya Pendidikan Islam (GeMa Islam) and e-Xra.com. VirTEC is an Asean one-stop online teacher education centre founded and developed by Prof Mohamed Amin under the Unesco Participation Programme. It was awarded a Gold Medal at UKM Research /Innovation Exhibition and a Silver Medal by the Ministry of Science, Technology and Environment Malaysia at the Invention Competition. He also designed and developed ELT-TreC to enhance the professional development of English language teachers in Malaysia. For this he was awarded the UKM Creative and Invention Award. To assist secondary school and tertiarty students in Malaysia learn English interactively via the internet, he developed the world’s first web-based learning-to-learn English programme known as e-Learn. This was widely reported in the media. For example one issue of the Sunday Star headlined:”Secrets of Smart Language Learners”. For his innovative ideas and publications related to his research project, Prof Mohamed Amin was awarded UKM Young Researcher Award. He and his wife Rohayati Haroun developed e-Xra C.E.P.A.T as Malaysia’s first computer-based learning-to-read programme to assist slow learners, dyslexic and autistic children learn to read Malay. The programme has successfully helped more than 25,000 children with reading difficulties to read Malay within 3-6 months not only in Malaysia but also in Singapore, Brunei and Indonesia. The innovation was awarded a Gold Medal by the Ministry of Science, Technology & Environment at Malaysia Technology Expo 2006. Another system developed by him, e-Mas (e-Learning Management System) is an open source e-learning management system designed to assist lecturers manage online courses in UKM. For this he was awarded UKM Information Management Award. Through his sabbatical research project, Prof Mohamed Amin developed a self-access e-learning content management system (SalMaS) designed to help the teaching communities at all levels of education access online teaching and learning materials/activities. SalMaS has been used by more than 250 lecturers in public as well as private universities in Malaysia. For this innovation he was again awarded UKM Creative, Innovation & Invention Award and awarded a Gold Medal by the ministry at its expo in 2006. Last year, Prof Mohamed Amin developed another unique e-Learning System known as SLIM or Second Language Instruction Management System described as the world’s first template-based Course Management System designed to allow second language instructors create and managed online language materials/activities related to the main language skills (reading, writing, speaking & listening). Policy makers from other countries who attended a presentation on the subject have shown deep interest to try out the system in their countries. In efforts to promote e-Learning in Malaysia he has developed a number of portals which are available for free athttp://www.ukm.my/elok ; http://www.ukm.my/myelearn and also http://www.ukm.my/mojel. To disseminate research findings on e-learning he has also published 10 books, 30 chapters in books and more than 60 articles in various journals. The books includes Computer Management System (2009), Readings in Online Language Teaching & Learning (2008), Online Teaching & Learning in ELT (2006), Teknologi Maklumat & Komunikasi dalam Pengajaran & Pembelajaran Bahasa Melayu (2008) and Panduan Pengajaran & Pembelajaran Berkesan (2009). 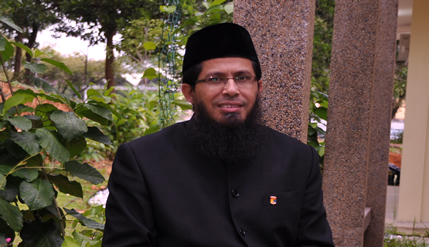 For his significant and outstanding academic contributions especially in the area of e-Learning, Prof Mohamed Amin was awarded the Best Teaching Award 2005 and 2006 by UKM and was the 1st recipient of the National Academic Award 2006 (Teaching Category) by the Ministry of Higher Education, Malaysia. He was also awarded Anugerah Melayu Cemerlang 2008 (Pendidikan) by the Malaysian goverment. The Penang born 47 year old Prof Mohamed Amin received his first degree from Brock University, Canada in 1986. A year later he completed his Diploma in Education with distinction at UKM and later became a tutor at UKM’s Faculty of Education after a four year stint as a teacher in Nibong Tebal, Penang. He obtained his doctorate from Leeds University in 1996.